Between us we’ve published a couple of dozen books (monographs, edited collections, historical dictionaries), a few score chapters and articles, and well over a hundred book reviews. This has required us to talk, email, and (this dates us) exchange actual paper letters with editors, assistant editors, copy editors, and editorial assistants. (Side note: it seems important that “letter” is only a noun, but “email” is both a noun and a verb. Hmmm.) We both go back far enough that our first books and articles were typed several times, and returned to us on somewhat greasy galleys and page proofs before seeing print. Today, however, it is not unusual for articles and even books to be sent back and forth between authors and editors without ever being printed out. In other words, when it comes to academic publishing, we’ve pretty much seen it all. But about two years ago, after a combined sixty years of dealing with publishers and editors, we’re now on the other side of the (virtual) desk. 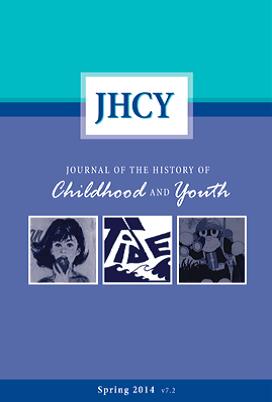 In 2013 we each took on a new job: Jim became editor of the Journal of the History of Childhood and Youth, which is published by John Hopkins University Press three time s a year on behalf of the Society of the History of Children and Youth. Jim also acts as book review editor. At the same time, Phil became co-editor-in-chief of the Journal of North African Studies (JNAS), which is published five times a year by Taylor & Francis (T&F) for the American Institute for Maghrib Studies (AIMS). In addition, he serves as publications officer on the AIMS executive committee, which, among other things, monitors AIMS research centers in Tunis and Oran. We’re responsible for soliciting articles, arranging outside reviewers, copyediting, and assembling the issues. One challenge we share is mastering the website ScholarOne, the online mechanism for submitting manuscripts, communicating with outside reviewers and authors, collecting forms, and doing all the paperwork associated with running a journal. Submissions are accepted by automated emails and we simply fill out pre-written templates accepting or rejecting (or somet hing in between) manuscripts, with reviewers’ comments automatically inserted into the email. It’s kind of like magic, although the structure of the site isn’t instinctive and eventually you have to get the final version of articles in WORD put them together old school (although, in fact, JHUP asks Jim to submit the completed issues via a share point site (through the dramatic sounding FTPsurfer! ), and two sets of page proofs are sent back to me on the same site. There are still parts of ScholarOne that remain a mystery; Jim hasn’t quite figured out how to delete articles that have already been published. JNAS was actually just adopting ScholarOne when Phil signed on. Although the transition has been challenging for his editors, authors, and reviewers, now with two year under his belt, Phil feels much more comfortable using the system. 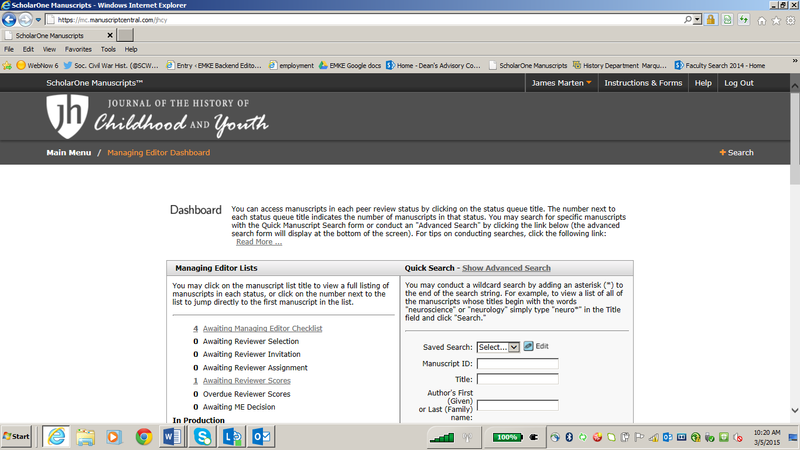 The Managing Editor’s Dashboard for the JHCY’s ScholarOne account. But there are also more substantive challenges and responsibilities. For Jim, whose research is rooted in the Civil War era in particular and the histories of children and youth in the United States in general, the main challenge is that the journal receives submissions from scholars all over the world and about children living in ancient Rome, colonial India, and modern Europe, Latin America, and Asia. For Phil, the fact that JNAS is an interdisciplinary journal is a strength as well as a problem. Occasionally articles are quite esoteric (e.g., microeconomic sector studies of a Maghribi country). Although Phil took economics courses in grad school, he readily confesses that he lacks expertise to evaluate an article filled with econometric equations and theories! Compounding the situation, there are relatively few others who can review these topics as they relate to North Africa. Social science subjects often dominate the submissions. Both journals are published exclusively in English, but draw readers and authors from around the world, which presents its own set of editorial problems. We frequently end up publishing pieces by scholars writing in their second or third (or even fourth in Phil’s case!) language. This sometimes to leads to rejections, as the English isn’t polished enough to appear in a professional journal; equally often, we simply have to take more time working with authors to get their research into publishable form. The same can occasionally be said for scholars writing in their first language! For instance, we sometimes have to work overtime to help authors from the social sciences impart a greater historical sensibility into the articles and to get them to produce citations in the correct format. At times the authors are graduate students or brand new faculty members trying to get their first publications. They require a different kind of encouragement (especially if we reject their submissions, when the “revise and resubmit” option can become a powerful way to indicate that changes are necessary while at the same time providing a bit of a push to improve their work). This latter responsibility is the best part of being a journal editor for Jim. The membership of the Society for the History of Children and Youth skews quite young, and he’s spent much of his time as a founder and long-time officer of the SHCY working with graduate students and newly minted PhDs, and it’s his role as a mentor that Jim finds most rewarding in his role as editor of the JHCY. Phil’s favorite part of editing a journal is making contact with scholars who share his interest in promoting North African studies. This has resulted in new friendships while reinforcing others. Furthermore, by reviewing articles and the occasional books, Phil has kept not only up to date, but also poised at the cutting edge of North African scholarship. Having conscientious and collegial co-editors upon whom Phil can rely upon regarding articles and reviews is especially beneficial and reassuring. He considers being an editor of JNAS a highlight of his professional career. Phil Naylor teaches courses on the Middle East, North Africa, Byzantium, and Rock and Roll. His most recent book is the revised edition of North Africa: A History from Antiquity to the Present. Jim Marten is chair of the department and the outgoing president of the Society for the History of Children and Youth; his most recent book is America’s Corporal: James Tanner in War and Peace.